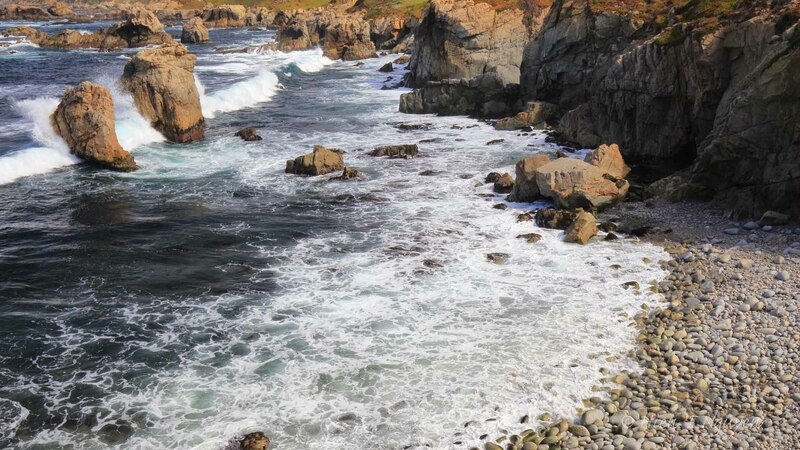 If you drive south from Carmel toward Big Sur, Garrapata State Park is on your right after about 6 miles. 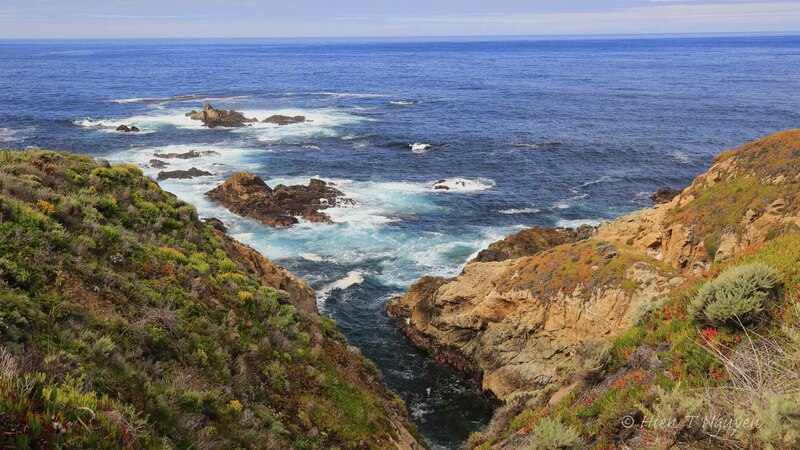 Many people usually hurry on to Big Sur without stopping, which is what I used to do. However, on this last trip, I did some research and discovered that over a distance of 2 miles (3.2 km) Garrapata has 19 access points called gates, each with several trails that lead you down to view points or a beach. 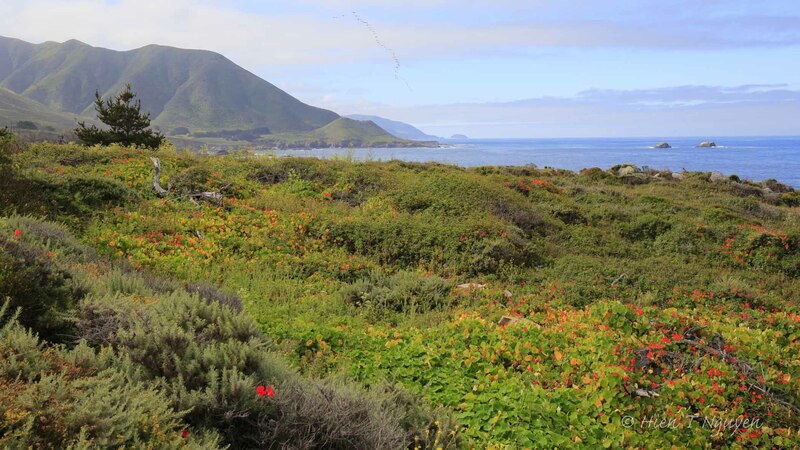 Other trails turn inland toward hills with excellent views of the coast from more than 1,000 ft (300 m). 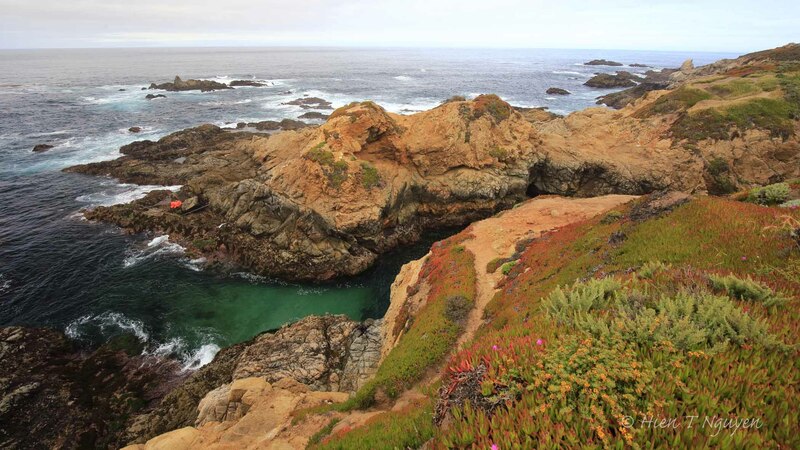 I did not go inland, but found the scenery along the ocean simply stunning with its colors and physical features. Spring flowers were in full bloom, and birds and other animals could be seen practically everywhere. If you read this, be sure to click on any photo to see it in a larger size. View from gate 1 at Garrapata State Park. Pelicans, seen as a faint line in the center of the picture, were flying toward us from a distance. View of the shoreline from Garrapata State Park gate 1. No idea what the two men in orange suits were doing. View from the end of one trail at gate 4, Garrapata State Park. 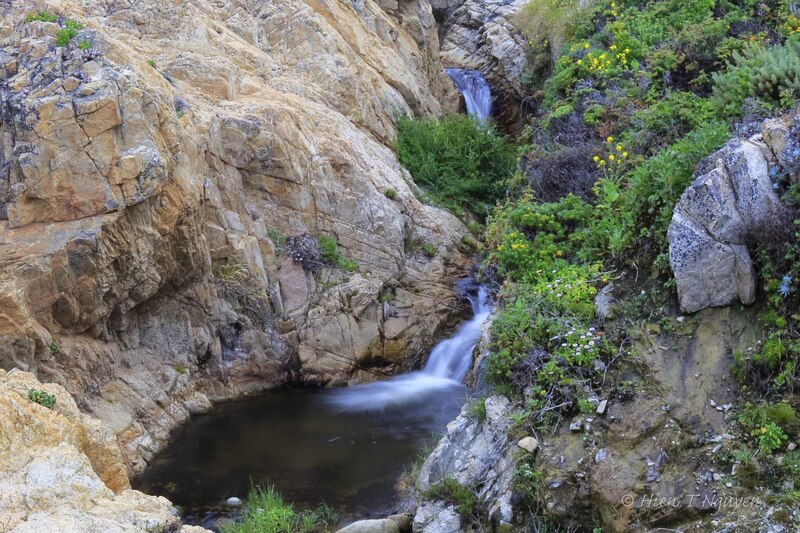 Gate 7 is my favorite because it has two small waterfalls created by Soberanes Creek as it flows toward the ocean. First waterfall at gate 7, Garrapata State Park. Second waterfall at gate 7, Garrapata State Park. Looking down at a cove at gate 7, Garrapata State Park. Gorgeous images. I was just there photographing Calla Lily Valley. Wonderful. I missed that Calla Lily Valley and will have to come back another time for it. Thank you for visiting and commenting! Gorgeous photos from a very beautiful park! Thank you Tiny! Sorry, I didn’t see your comment until now. Thanks Diana. It is a nice place to walk, one small section at a time. The road is about 90 miles long (145 km). Beautiful captures and a beautiful area to capture! Thank you John! It’s a beautiful area indeed. 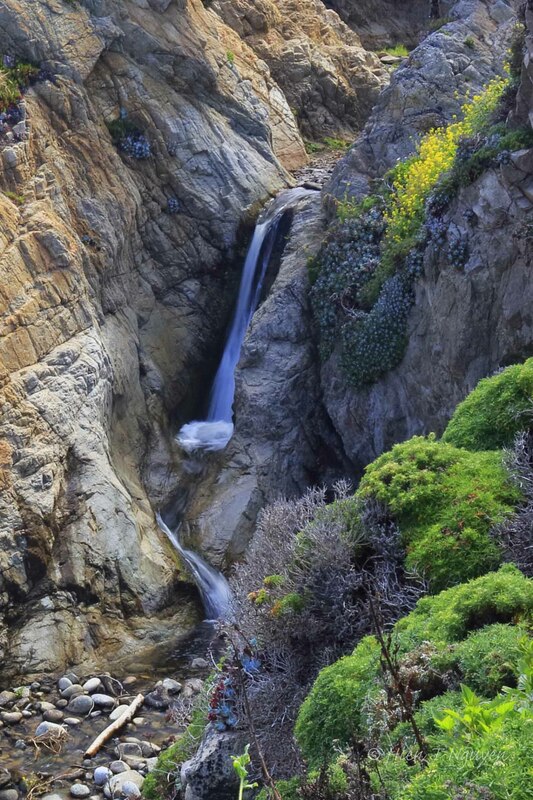 The views over the waterfalls are breathtaking and so is the scape where the ocean meets the rocky land! Thanks Doda. Do you places in Greece or the Mediterranean sea that look similar? We do have,there are plenty of them in high mountains which smoothly meet the sea all over Greece.Thank you Hien. Gorgeous landscapes, I clicked on them all to view in full. How can anyone just drive by. Definitely time to stop and smell the roses. Thank you Beth! People seem always to be in a hurry to go somewhere else. Sometimes it really is good to slow down to stop and smell the roses. So glad you read about this, Hien. Beautiful photos. I agree with you entirely. Thank you for commenting. Thank you Nia. Have a nice weekend! Beautiful area and images. What a wonderful place to explore. Thanks Nick! It is a place that I could go back to again and again.